Here's a look at the exclusive bookplate with new art by Jim Lawson that you'll get if you order the Tales of the TMNT Collected Book #5 from PanelToPanel.net. The bookplate will come signed by Jim, Murphy, Dan Berger, and Peter Laird. John at Panel to Panel also reveals that starting with this book, the bookplates will no longer come tipped in/attached to the book. This is so that you can enjoy the art outside of the book as well. Sounds like a plan to me! Tales of the TMNT Collected Book #5 should have arrived at comic shops this past Wednesday. Panel to Panel will begin shipping them next week. Tales of the TMNT #43, featuring Casey Jones's proposal to April O'Neil, shipped to comic shops this week and is now available. If your comic shop doesn't carry it, whap 'em on the head and force 'em to! If that fails, you can order directly from Mirage. MoronQueen found this image in a community of random images. Unfortunately, I don't know where it originates from, but it's pretty awesome. There remains to be a bit of confusion about The Next Mutation's availability, so here's the complete run down. The complete series is now available on DVD in the UK. As such, while the box says Ninja Turtles, the theme song and titles on the episodes say Hero Turtles. It also seems to be the case that some episodes have been edited, but this is pretty much your only option unless some miracle sees these released in the US some day. The set on the left, Volume 1, is a repackaging of three discs that were previously released. Those three discs are East Meets West (episodes 1-5), Staff of Bu-Ki (episodes 6-8), and All in the Family (episodes 9-11). This is important information, because based on the Amazon.co.uk listing, this set is now out of print. If you can't find the set, perhaps you can find the individual discs. The set on the right, Volume 2, just got released this month after being delayed from its original 2007 scheduled release. This set is a true box set that features episodes 12-26. You can currently find this set on Amazon.co.uk, but I would recommend purchasing sooner rather than later, as all of these have been going out of print very fast. If all else fails, there's always eBay, but you'll need to look at eBay.co.uk. At the moment, seller drstevew has both DVD sets available (Volume 1, Volume 2). Of course, to watch any of these you'll need to be able to play Region 2, PAL-encoded DVDs. To do this you can buy an expensive region-free DVD player or there are ... other ways. A little time spent with the Google should help you find information that will allow you to view these discs without spending any additional money. While the TMNT showing at Toy Fair is never huge, this year felt particularly disappointing. Well, half good, half bad. The display of the new NECA figures was nice, but nothing particularly new (especially for readers of The 5th Turtle). 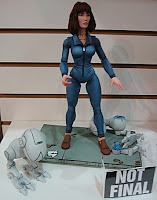 We did get to see the painted April prototype for the first time (with mousers!). Perhaps best of all is the numerous Web sites photos of these figures showed up on, giving the figures wider exposure to collectors at large. In the Mini-Mutant department, it was revealed that Playmates isn't just dressing the Turtles in stupid extreme sports gear, but also secondary characters like Drako. Yay? I suppose I shouldn't complain too much; this just leaves me with more money to spend on the cool stuff that was shown at Toy Fair. Let's see, there's General Kenobi, 12" Indy, Indy Mighty Muggs, Doctor Who Mini Mates, Flight Control TARDIS, Doctor Who Weeping Angel (I'll need 4 of these), Padme Evolutions set, and more Galactic Heroes than I can count. What do all of these toys have in common? Absolutely none of them are dressed in made-up costumes and all of them are awesome. Tales of the TMNT Collected Book #5 is now available for pre-order at PanelToPanel.net. As with all of the previous collected books, PanelToPanel is offering this one with an exclusive, signed bookplate (while supplies last). Tales of the TMNT Collected Book #5 collects Tales of the TMNT Volume 2 issues #2, #9, #15, #17, and #25. It is expected in stores March 5. "The Secret Origins of the Super Turtles" - this issue takes us to an alternate dimension where we discover how the super hero Turtles (featured in "TMNT" Volume Four #7) came to be! Alien invaders must be stopped - can Dr. Shreddarius' army of Terrorkinetics™ prevent certain doom - and just whose side are they on? A titanic Turtles tale featuring an epic battle between good and evil that harkens back to the stunning Silver Age of super heroes! 'Nuff said, pilgrims! "Who are the Teenage Mutant Ninja Turtles?" 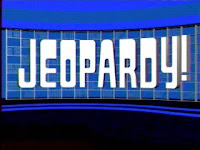 was a question on today's episode of Jeopardy! Teen Tournament. TMNT fan Ninjatron found links to job fair information for Imagi, the animation company that brought last year's TMNT movie to life. You can check out more images and information (in Chinese) at Felix Ip's blog (here and here). Felix worked on TMNT as a producer. 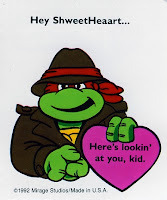 TMNT Flashback: Happy Valentine's Day! 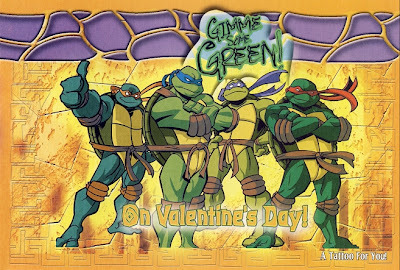 Wishing everyone a Happy Valentine's Day, here's a look at four different styles of TMNT valentines that have been released over the years. 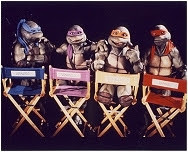 I have a whole bunch of original press photos from the old TMNT movies that I would like to get rid of. You can check them all out and, if interested, order directly from my eCrater store. Blade Raider at the Technodrome found this ShortPacked comic guaranteed not to start any political debates. I started this blog as a way to put all of the latest TMNT news in a single place so that it would be easily accessible to people without the need for hunting through various forums or scouring other parts of the Web to keep up to date. I still hope to do that to a certain extent, but you've probably noticed I haven't posted in a couple weeks. There are several things that I could have posted, but a recent post by Steve Murphy at the 5th Turtle kinda killed all of my motivation. One of the hardest parts of being a TMNT fan, especially a long-time fan, is the extreme lack of direct communication with fans that has persisted for years. This isn't to say that the people at Mirage Studios aren't accessible. In fact, due to the small size of the company, they're far more accessible than the majority of companies that are behind giant licensed franchises. But short of e-mailing Dan Berger directly and asking point blank, there's always been a separation between the fans and news on current and future projects. That changed when Murphy started his 5th Turtle blog. Not only was he providing us with current news, but his interaction with the fans who posted comments showed us that someone at Mirage actually cared about what we thought about things. Both positive and negative opinions were agreed with. We were being heard, and even though our voices still weren't resulting in changes that would give us better things, we felt better about being fans. But now 4Kids and Imagi, and to a lesser extent, Playmates and NECA, are requiring that Steve Murphy no longer share any images or info with us unless they give explicit permission. There is a certain amount of logic to this request (and it has been greatly debated, but this is not the point of this post), but unfortunately it brings us back to where we once were: With no direct link to information on current or future TMNT projects. What's in store for the TMNT? Who knows... I think I'll go watch some Doctor Who. 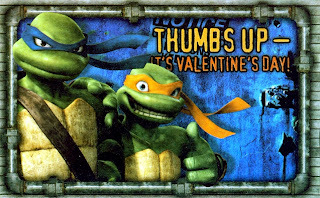 4Kids has made it clear that they don't care about TMNT fans over the age of seven. 4Kids earns change on every single piece of TMNT merchandise that is sold. I am done feeding the 4Kids machine. 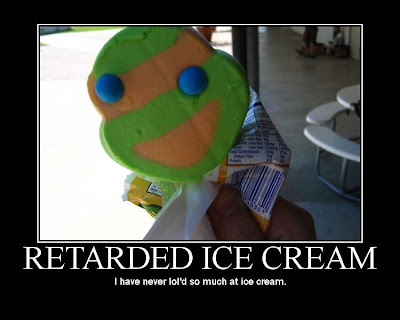 With just a handful of exceptions, I have no intention of buying new TMNT product. Anyone who knows my ridiculous ability to acquire things knows that this is a pretty crazy statement to make. But I mean it. I'll spend my money on eBay on old TMNT stuff. It's impossible for me to ask the same of others, but I do hope that some of you will rethink what you spend your money on. Continuing to hand money over to 4Kids isn't going to convince them that they need to do something more to please us. With this in mind, how can I continue to pimp every single TMNT item that shows up on a store shelf? Not that I was covering everything anyways, but I was trying to cover everything that I could. I really can't, so I'm going to refocus the purpose of this blog a bit. I'll still pimp a few new items (comics definitely, other things on a per item basis) and new products with specific release dates will still be listed in the list to the left (but they won't necessarily be posted about individually). I'm going to try to post TMNT Flashbacks more regularly and maybe feature some goofy eBay auctions and other things as I find them. If you have any links or suggestions, or there's something you'd like me to post about, just send me an email and I'll do what I can.